La Puente California resident Tom Hutchinson shared some of his old photos with David Zivot. He also shared an very interesting Ayala story told to him by his father, who knew the Ayalas. Tom Hutchinson Jr from La Puente, CA. who shared these photos and the story with David E. Zivot is the little boy in some of the photos. 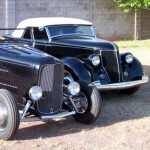 The ’39 Merc pre-War custom and the ’36 Cabriolet were both built by and belonged to his Father Tom Sr.
Tom Hutchinson Jr as a little boy with his mother and his father’s Custom Restyled 1936 Ford Cabriolet in the late 1930’s. Tom Sr. created this chopped and padded topped (Most likely by the Carson Top Shop) 1939 Mercury Convertible. 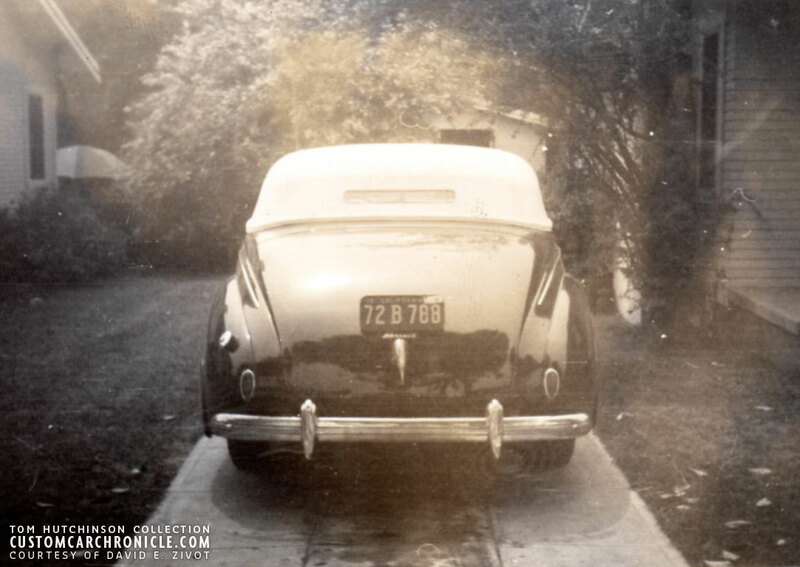 Tom replaced the stock Mercury taillights with teardrop ’38-39 Ford units. 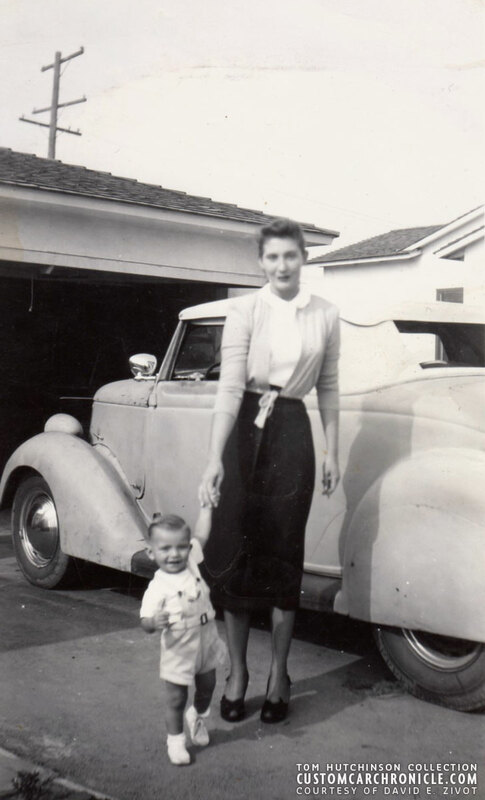 Tom Jr. a little older now with his mother and in the background his father’s ’39 Mercury with chopped padded top. 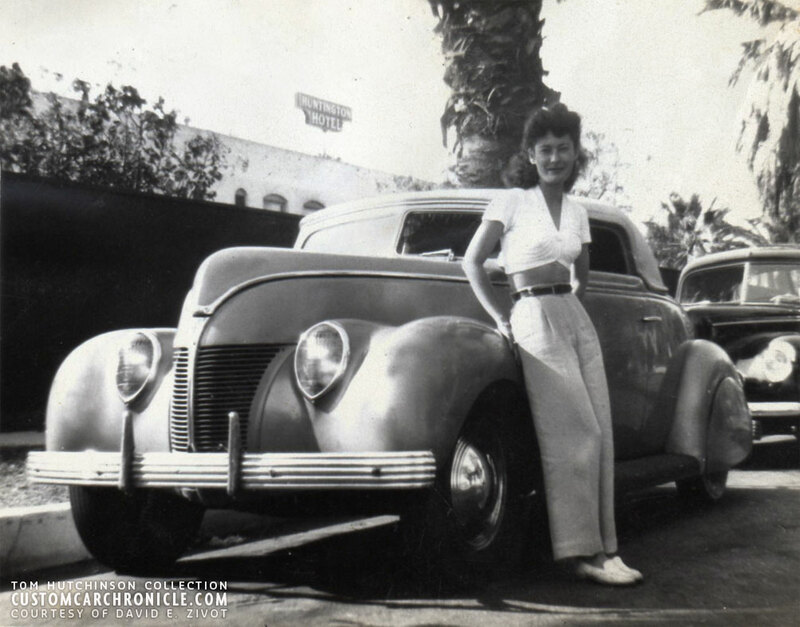 This photo of the ’39 Mercury was taken in 1943, by then a set of ’37 DeSoto bumpers replaced the stock units. Notice that the car ran two Appleton Spotlights, during a period that the cops were not always pleased with that. The Gorgeous Gal in the other two photos with Tom Jr is his Mother Imojine. 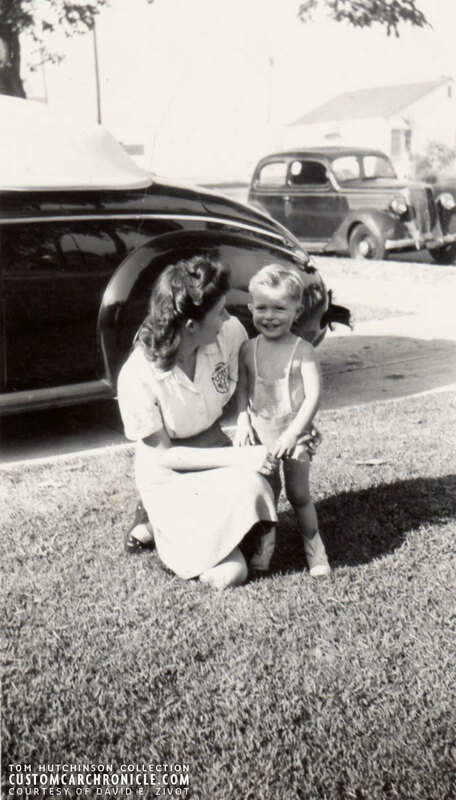 The Debonnaire Dame in this photo with the pre-War custom ‘38 Ford convertible, is Tom’s Aunt Dorothy. a story by David E. Zivot. This story is based on what Tom Hutchinson Jr has told David E. Zivot. 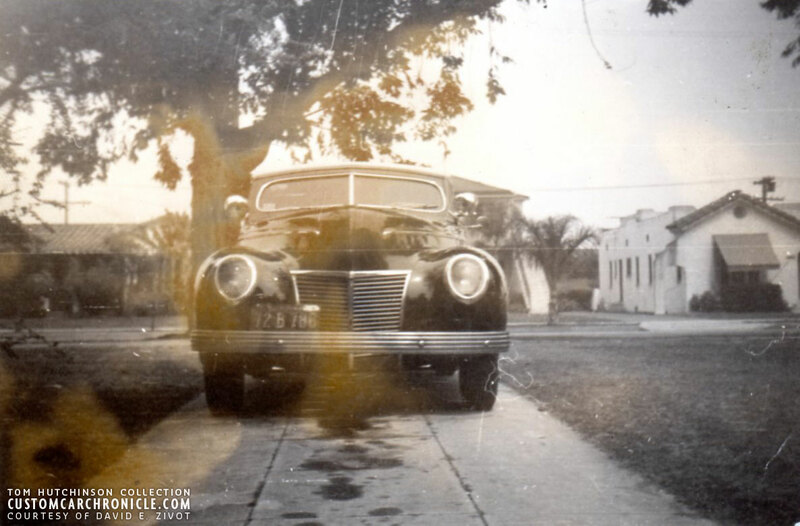 The story is about Gil Ayala’s 1940 Mercury with chopped top, full fade away front fenders and Cadillac fish-tail rear fenders. Tom Jr.’s Father, Tom Sr., was good friends with both Ayala’s, and actually did the plastering work inside the House of Chrome building. It needed work because it was run down and did not meet building code. 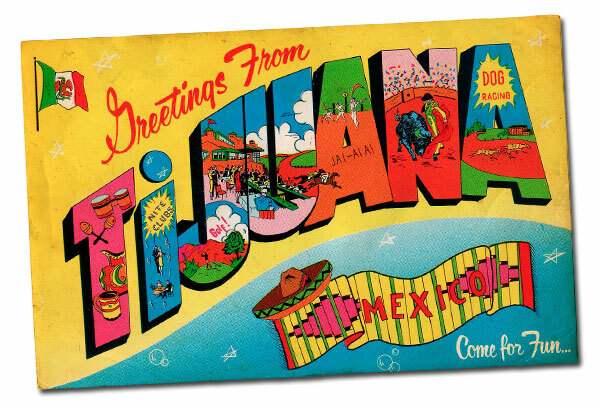 Gil Ayala’s ’40 Mercury in Mexico? Tom Jr said his Dad told him that one of the Ayala Brothers (He was not sure if Gil or Al, but more than likely this was Gil, because we know Gil was very much into racing.) was doing some very fast street racing with the ’40 Mercury when the cops spotted him and gave chase. The Ayala that was driving crossed the border into Mexico and hid out there for a few days until the heat died down. He returned to Los Angeles without the ’40 Merc. 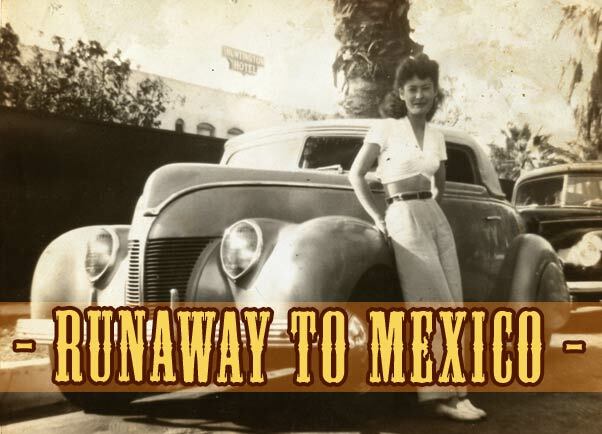 Just think, the car could still be somewhere in Mexico sitting in an old rambling shack. Remember the Roth custom that was discovered a few years ago in Mexico? I like to think that this is not an apocryphal story, and that it still exists somewhere down Mexico way, and that somebody would discover it and return it to the U.S. for all to enjoy! Another thought is perhaps one of the Ayala’s, probably Gil, was driving it when Richard J. Stickley already owned the Mercury? Tom Jr told me that the municipal court judges were really cracking down on street racers at that time. They were making the guys sell their cars, and even ordering that their cars be crushed, and that they do six months on a prison farm. So it seems understandable that they would head over the border and not come back with the car, maybe hoping to pick it up later. 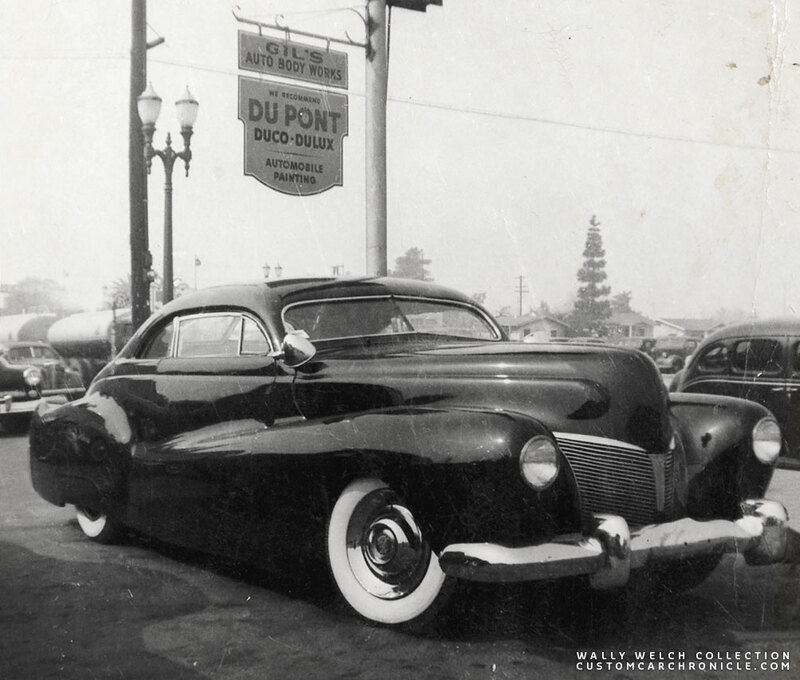 Gil Ayala’s 1940 Mercury parked at the Gil’s Auto Body Shop in East LA in 1949-50. Tom also shared two very early Hot Rod photos, both photos were taken in 1938 and are part of his fathers old collection. 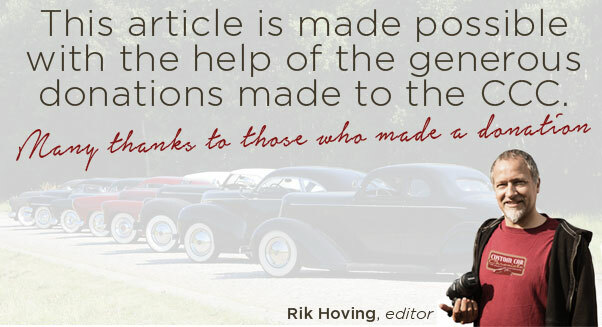 This shows once again that Custom Cars and Hot Rods went hand in hand together in the early beginnings. The Custom Cars were just more practical if you had a family like Tom Sr. was just starting in the late 1930’s. 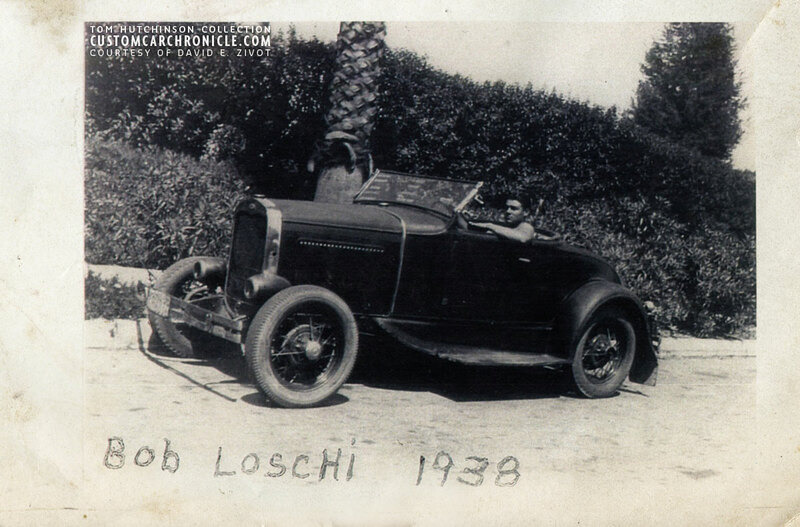 One shows Bob Loschi’s Model A Roadster which looks to be mostly stock except for the removal of the front fenders, raking of the windshield and addition of the E&J (Edmunds and Jones) headlights, a rare aftermarket item, also known as the E & J Type 20 Bullet lamp. 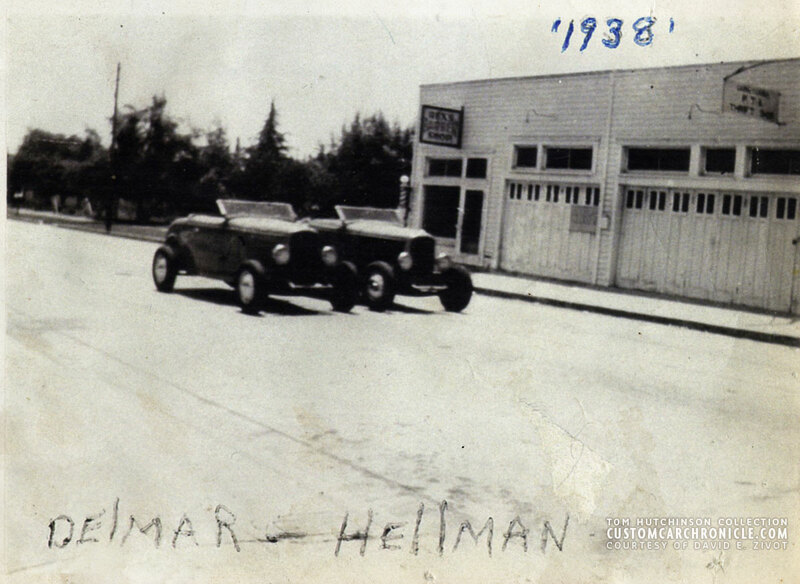 Delmar and Hellman both had ’32 Ford Hot Rod Roadsters. A little fuzzy photo, but these two near identical early Hot Rods are just too good not to share. This a great story about my favorite 40 of all time.